Our first full day on the island, we divided between the 2 1/2 hour $60 combination tour of McBride Garden and Allerton Garden (together making up the National Tropical Botanical Garden) and the hanging out on our lanai listening to birds, reading, and looking out at the Lawaii Valley (in Italian called "il piacere di fare niente"--the pleasure of doing nothing). **DH reminds me to explain the expense of the garden is that it is a NGO who job it is to preserve plants and who receives no money from state or federal government (thus cannot be subject to budget cuts from said governments). The gardens came recommended both by Kathie and our innkeeper, Sarah. There were 12 of us on a minibus with an excellent Hawaiian guide and driver. We stopped several times to take walks--one to a lovely pool and waterfall available to be seen only on this tour, another to go through the very cool trees that were filmed in Jurassic Park. Even DH, who was a reluctant but good sport participant, had a fabulous time. Great for garden fans, movie fans and people who don't like gardens. What seemed to be a considerable expenditure turned out to be excellent value. Also in the excellent value department was our dinner at downstairs Merman's in the pleasant upscale Shops at Kokui'ula near Poipu Beach. We have now three times eaten an early dinner there during Happy Hour (3:30-5:30), when all food is 25% off and drinks are reduced as well. Food is very good: pizza better than Brick Ovens, fish, vegetable and carnitas tacos excellent, good salads with many kinds of burgers. Highly recommend (and another mahalu for Kathie). We were less enthusiastic about the much acclaimed Lappert's Ice Cream nearby -- good with excellent selection, but for us not to write home about (home being the SF Bay Area). The following day we headed for breathtaking (both literally and metaphorically if you hike) Waimea Canyon, as beautiful as we remembered from 20+years ago. We stopped on the way at the excellent quality Red Dirt Outlet to buy t-shirts in Ele-Ele. The mistake we made was not to leave earlier, much earlier, as much of the rest of the island was there with us by the time we reached the lookouts just before noon. (I cannot overstate the compellingly peaceful and restful quality of being surrounded by the Lawaii Valley on the lanai or comfortable bed) Hiking a bit in the Canyon, the crowds lessened, though the heat did not and we had a very fun late lunch on the way back at Shrimp Station food truck in Waimea. Next day at home, except for sunset walk near Shipwreck Beach. We drove to north to Hanalei, planning to stop at lighthouse and bird sanctuary on the way. Note: said lighthouse and bird sanctuary is closed on Mondays. Walked through Princeville Resort (formerly St Regis) hoping for elegant lunch with view. Lunch served at pool. Resort did not warm our heart but there is both a bar and a restaurant with spectacular views, bar open at 12:30, restaurant open for breakfast and dinner. On to Hanalei where we had enjoyable lunch at Calypso, hawaiian sports bar with the best banana daiquiris I have ever had in my life. I had two. Despite this, we took an enjoyable 1 1/2 hour walk along nearby spectacularly beautiful Hanalei Bay. Note: Hanalei Bay is one of the few places where you can take long walk on beach on the island. Also note: Barking Sands beach is no longer open to the public. We loved it when we were here before. Post 9/11, you need military ID or apply for permission to enter months in advance. ; a missile base is now part of the beach. I like this beach so much I would have made the effort had I known it was needed. Our splurge ($360 for two) on this vacation was a 5 hour sunset dinner cruise to the Napili Coast by Captain Andy's adventures outfit. We were on a 60 (?) foot catamaran which at first seemed crowded,but was fine once people spread themselves out. The sea was mostly calm, we several times spotted dolphins and mother whales with their babies leaping into the air what seemed like only 100 yards from the boat. The Napili Coast itself was stunning, with a beauty almost sacred, dinner on the way back was excellent grilled steak and shrimp (I believe there was a vegetarian option), then the day ended not only with a beautiful sunset over the water, but a lovely full moon rising over the mountains of Kauai. It was magical, made more so by a nice couple that we met that we spent the afternoon with. One more time excellent value for money spent (our budget conscious theme continues) Practical note: take a jacket, it gets quite cool in last hour or so of the trip. Another note: it was only budget considerations that kept us from taking a no doors helicopter tour. We had done that on our last visit to Kauai and loved it. I had also gone by myself years before when I visited Princeville with a friend and her children. I would urge people to save for the helicopter if need be, sacrifice nice dinners if need be. It is the single most thrilling and awe inspiring tourist experience I've ever had. I would do it every time I visit Kauai if it were feasible. (It matters what company you go with). OK, enough for now. TBC--this is going to be a more than two part trip report. It sounds like such a wonderful trip. I agree that the Napali Coast by boat is not to be missed. I did many trips to Kauai before moving to Princeville two years ago -- and I've never been to the Lawai Valley. It is now on my list! Great report, thanks. Sounds like you may have been on Captain Andy's Southern Star, think they are the only ones who serve hot food. Very close --it was Captain Andy's Northern Star. The Southern Star was identical and left at the same time. We took two hikes on the island we really liked (as well as hiking 1/2 hour down the Canyon trail of Waimea Canyon) The first is the Maha-ulepu Heritage trail, a 5 mile mostly level trail which starts from the parking lot of Shipwreck Beach. There are many many beautiful views of the sea along the way, as well as a perhaps 15 minute walk on the edge of the Grand Hyatt gulf course. Maha'ulepu beach itself is stunning, one of the the few beaches on the southern part of the island that is long enough to hike. We settled for a picnic midway on the beach before returning. Note: there are many variations of this trail, the most inland the most easy, the closest to the sea the most spectacular, with a couple of spots we judged too tricky to navigate. Alexis, one of the owners of Marjorie's Kauai Inn, where we stayed, told us also of another way to get to the beach. You can drive down a dirt road to the stables, which are very close to the beach, then hike the beach around the cliff which marks its end and go considerably farther. Since our car rental stipulated no dirt roads, we were cautious and did not take this option. I should also note that the Maha'ulepu Beach closes either at 6 pm or at sunset because all access to it is on private property. The other hike we very much enjoyed was the Nounou mountain (sleeping giant) east trail, 3 1/2 miles out and back, but strenuous, with a thousand foot elevation change in a mile. We stopped at the picnic area near the top; going on to the Giant's summit would have involved hand and foot scrambling on rock, which we decided to pass on. Hike was through forest with many stops on the way to photograph nearby lands and sea (and catch our breath). I should note that there is one perhaps nine foot stretch of this trail which involves scrambling up or down rock, where it is possible to hurt yourself. I, now officially "young old" (yes there is an official designation of "young old" "old" and "old old") and overweight, but an experienced hiker, did fine with the coaching of DH. I recommend doing the downhill return of this stretch facing into the rock. I would not venture it alone without someone to help out with finding good footholds. I'd also recommend bringing bicycle gloves (which we often hike with but did not bring along) and shoes or boots with good traction (some younger people were managing in flip flops). In fact, we wore sturdy hiking shoes on the plane and are very glad we brought them along with Keen sandals. What else: cocktails yesterday at the Beach House during Happy Hour (whose banana daiquiri I do not recommend, but which they kindly replaced with a quite good Lava Flow) with a spectacular view, then a trip to Hanapepe for their Friday night art show and market. We liked the Talk Story bookstore, but were not taken by the street festival itself and left early for a good, moderately priced dinner at Kalaheo cafe. Last night it rained, which made for really lovely rainbows over the Lawai Valley this morning and kind of did in our plans to hike in rain forest today, because there is not enough time for mud soaked footwear to dry before our flight home tomorrow. We spent the morning reading on our lanai, continuing to soak in the peaceful beauty of the valley. It remains to be seen if we will take a late afternoon walk before dinner or end this very relaxing vacation with a day of total relaxation. Thanks for your report. It sounds like a wonderful trip. I'm glad you had such a good trip to my favorite island! Songdoc, if I had been aware there is a Fodorite in the northern part of the island, I would have asked for suggestions about what to do with the road being closed beyond Hanalei. Nonetheless, we had a really fun lunch at Calypso and a nice long walk along Hanalei Bay on a sunny day with high surf. For the day we had to spend there, I'm not sure it gets much better than that but would welcome suggestions for next time. cmstraf: Hopefully, by your next visit, the road north of Hanalei will be open further. The last I heard, they are hoping it will be open to Wainiha by the end of May. That still won't allow access to Haena or Ke'e Beach. But it will include Lumahai beach. I haven't heard about any actions to shut down legal B & Bs. The battle I've read about is with people illegally renting their homes--or portions of their homes--as vacation rentals. From the photos, Marjorie's Inn does look beautiful. It has some of the clearest water. Songdoc, that beach is gorgeous and I've never heard of it (this was my third trip to Kauai). Is it in the North? 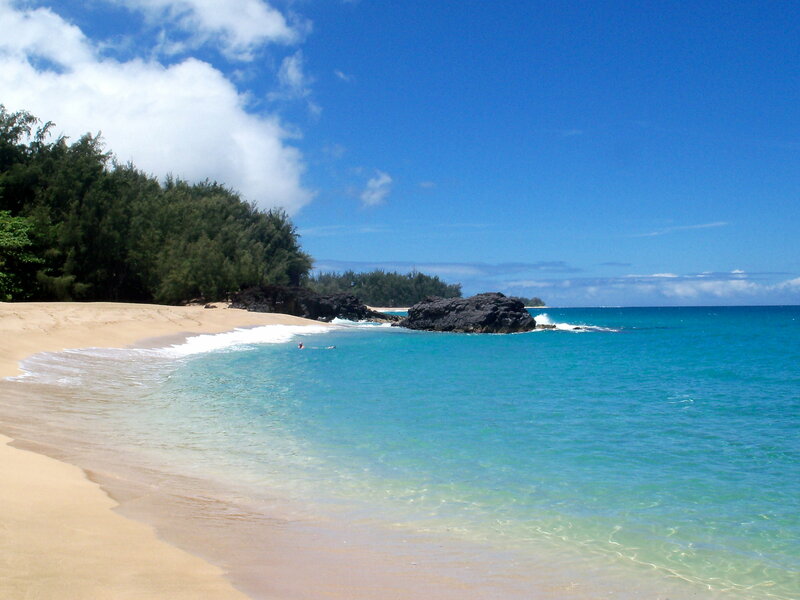 I have been to the beach by Haena many years ago, but I don't remember its name. What I've heard about the rental situation is that both allegation vacation rentals and B and Bs are being targeted, that the state of Hawaii wants tourism to be restricted to Poipu, Lihue, and Princeville/Hanalei, and that there is an attempt to turn even legal B and Bs in residential non tourist areas either back to inexpensive housing for native Islanders who have been pushed out of the North by increasing prices or regain it for agriculture. I don't know enough about Hawaii politics to understand this fully, but it seems unfair to legal owners who are disturbing no one. Marjorie's Inn is so discretely located and the guests (i.e. me) are too innocuous and inconspicuous... I selfishly really hope this turns out well. I become very attached to place and its been some years ( Volcano Places on the Big Island and Rohutu Fare on Bora Bora, no there was also Glacier Guides Lodge at the west end of Glacier National) since I've had such a feeling of home and loveliness in a place that is also moderately priced. (even though I did not care for the mint green walls of our room, having thought they were that lovely soft Asian green). Lumahai Beach is north of Hanalei, but not very far--not nearly as far north as Haena. From a different angle, you can see the gorgeous, jagged mountains in the distance. I'm guessing you're referring to the very popular Makua ("Tunnels") beach. I love to walk from there to Ke'e. I can hardly wait until that road is open! FYI, we moved to Kauai from Nashville. We had been spending more and more time on Kauai over more than ten years. A couple of weeks a year became a month; then 2 months, then ... By the time we moved, it really felt like a second home. I would grieve every time I had to leave. But it's not as if I just cut ties. I still work in Nashville 4 - 5 times a year (2 - 3 weeks at a time) and have family there. We keep a car in Nashville and have a little private area in my mother-in-law's home. PS. I love the Bay Area and I'm crazy for Yosemite! And that's an easy flight to Kauai! I've been going to Yosemite most years since 1972 and several times a year since 1992 when I met DH. I have favorite rooms both at the Ahwahnee and Yosemite Lodge and would be glad to share them on your next trip (as well as meet in real life sometime when you are in SF). In a payback of karma, I once wrote a small trip report (post?) on how to avoid Yosemite crowds in summer, which has now disappeared somewhere in Fodor cyber space--and summer has expanded from Memorial Day to Labor Day to late April to October, but it remains the home of my heart. Oahu/Kauai Report - Part I - Kauai - Roosters, Roaches, & Reptiles! The Big Island: stay in Kona and Hilo or just one?